Most of us use TeamViewer to remotely access our home or office computer when we are not in there and also to share our computer screen with others. When we remotely access someone’s computer with the help of TeamViewer we couldn’t able to view their cursor (mouse pointer). 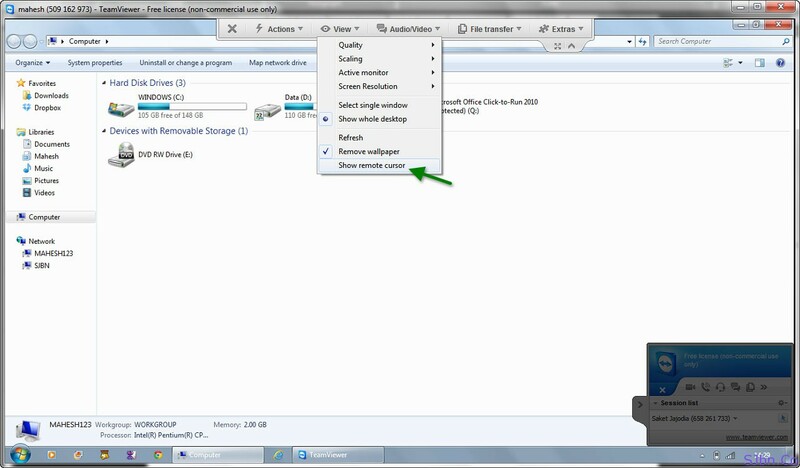 So when first person (whose computer we are remotely accessing via TeamViewer) try to do or show anything on his computer we won’t be able to know what he is trying to show as the mouse pointer is not visible by default. I generally face this type of problem a lot as because when I need to discuss about the designs with my designers I couldn’t able to see their cursor when I am accessing their computer or vice versa. It happens because by default show remote cursor is disabled. So to view remote cursor you need to manually enable it every time you connect with a remote computer. After you connect to remote computer click on View option from top menu bar (if you can can’t see the menu bar on top then click on the arrow on top to pull down menu bar), now click on Show remote cursor, after you click on it you will able to view the remote cursor remote computer.